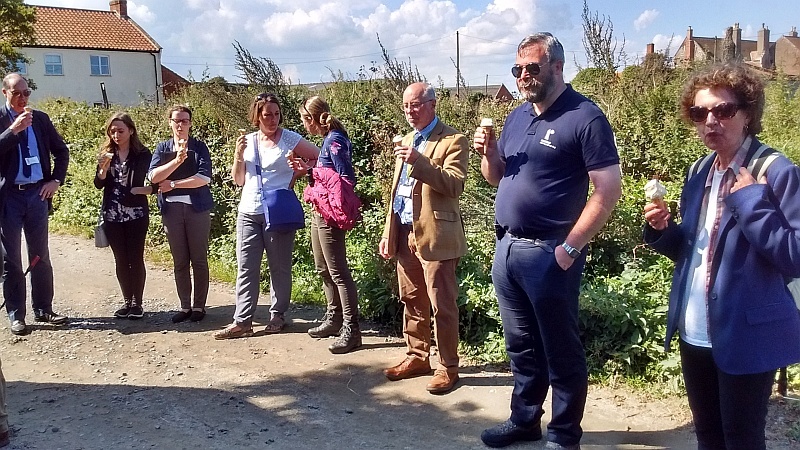 As part of the update on the England Coast Path, Lord Gardiner, the Parliamentary Under Secretary of State for Rural Affairs, came to visit Norfolk to see how the project was progressing. 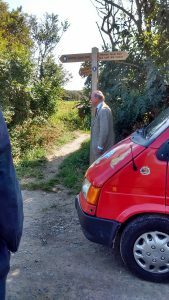 On the morning of 1 September 2017 he visited Great Yarmouth, where he sampled a newly constructed boardwalk built to provide improved access to the beach there, linked to the England Coast Path. 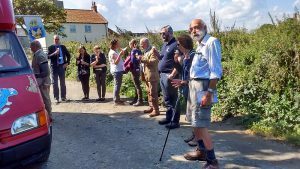 Four RA members, three of them on Norfolk’s Area Council, met him at Waxham – Richard May (Chair), Ian Mitchell (Footpath Co-ordinator), Ken Hawkins (Secretary) and Catherine Hawkins. Ken and Catherine had surveyed the England Coast Path proposals before implementation; Ken and Ian had met several times with NE staff to discuss RA views, and drafted the formal RA response to the NE proposals when they were issued. All three had subsequently taken various roles in making comments for improvements to Norfolk County Council after the two stretches were opened. 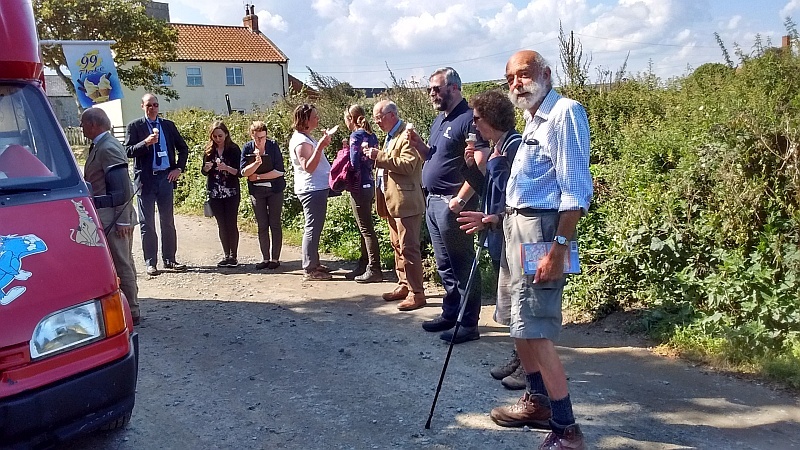 Lord Gardiner made plenty of opportunities to talk (and listen) to all present – Natural England staff, members and staff from Norfolk County Council, Martin Sullivan (Chair of Norfolk Local Access Forum) and the contingent from The Ramblers. He came across as knowledgeable of both the context and specific issues, and expressed interest in the wider environment (eg the sea defences at Sea Palling, and the pipes which had come adrift and were awaiting ‘rescue’). He also generously bought ice creams for everyone in the party from a van parked at the start/end of our short walk. Comment had been made to Lord Gardiner that we thought it would be beneficial to local businesses in widening their season. This had been taken up with an interview at Great Yarmouth (Munchies), and a similar discussion was had over lunch at the Waxham Barn Café, where he spoke both to the owner Helen and a member of her staff who walked to her job there from Sea Palling, in preference to using the road (which was derestricted and without a footway for a substantial part of its length). The Minister was responsive and interested in hearing about the concerns of the Ramblers and we hope to continue that engagement. 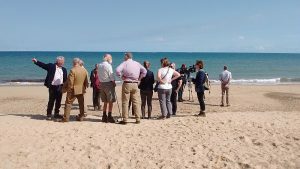 We were also pleased to see the level of media interest on the day, with Anglia TV covering the event. 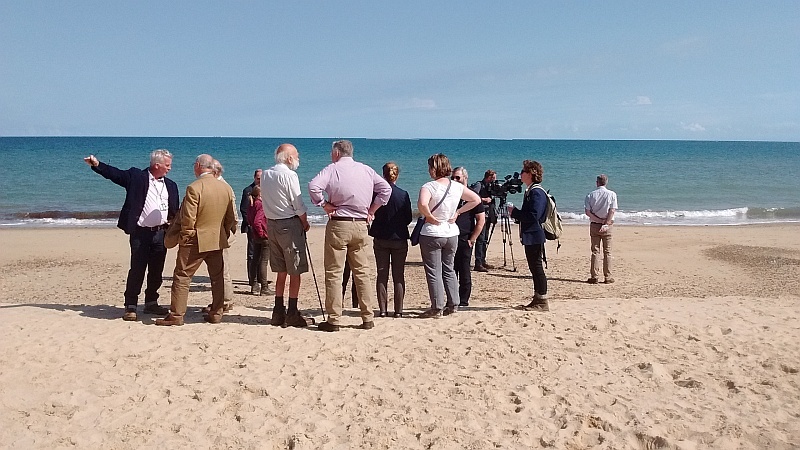 The day was a great success and we’re delighted to see progress being made on the England Coast Path, a project which the Ramblers has been heavily involved with both locally and nationally.